What is Euro Air Fabric Ducting? 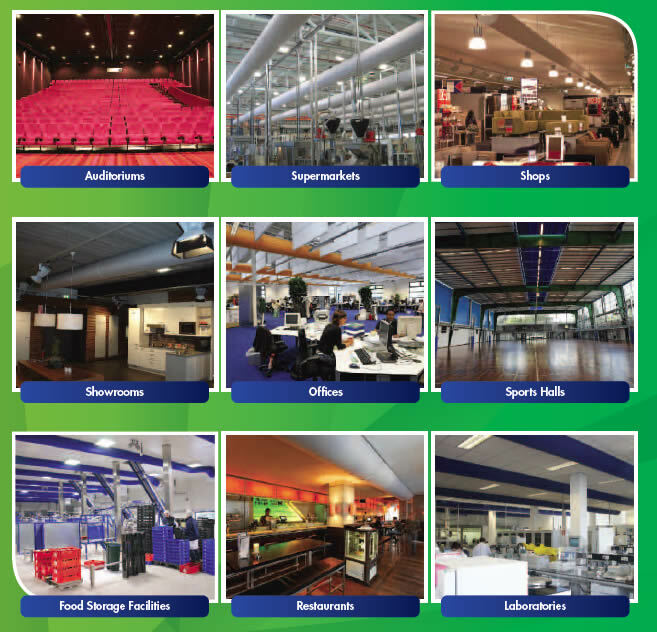 Euro Air Ducting is an alternative to traditional steel ducting and diffusers. Due to advances in technology, instead of transporting air through steel ducts, we can now use ducts made of permeable fabric. 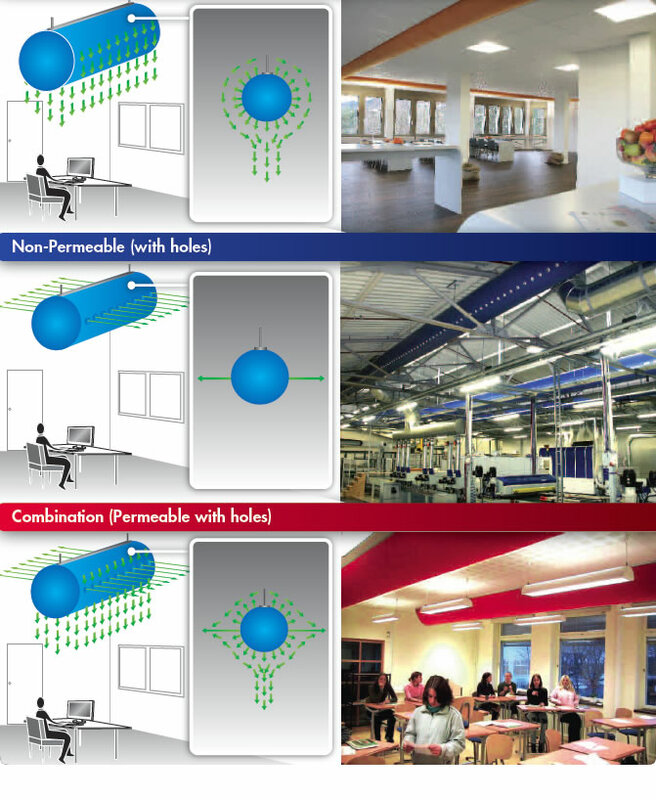 The heat load calculations and equipment sizing remains the same as traditional systems, but instead of using metal ducts to transport the air, we use patented fabric. This allows us to design air-conditioning systems which achieve better air distribution and save energy. 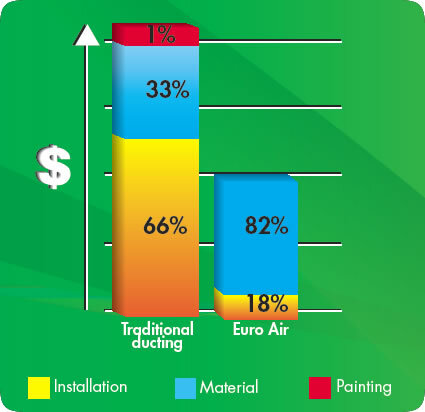 Due to the ease of working with fabric, Euro Air systems can also be installed in a fraction of the time as compared to traditional ducting resulting in significant cost savings. Euro Air technology is revolutionizing the air-conditioning industry. Established in Denmark in 1991, Euro Air has provided over 100,000 state-of-the-art HVAC systems in more than 30 countries. Euro Air Ducting is energy-saving in design and is made from textile with no harmful substances. Up to 20% energy savings as compared to a traditional system. Euro Air ducting can be installed in a fraction of the time reducing installation time by up to 80%. Simple cleaning and maintenance means Euro Air ducts can be removed and laundered easily. 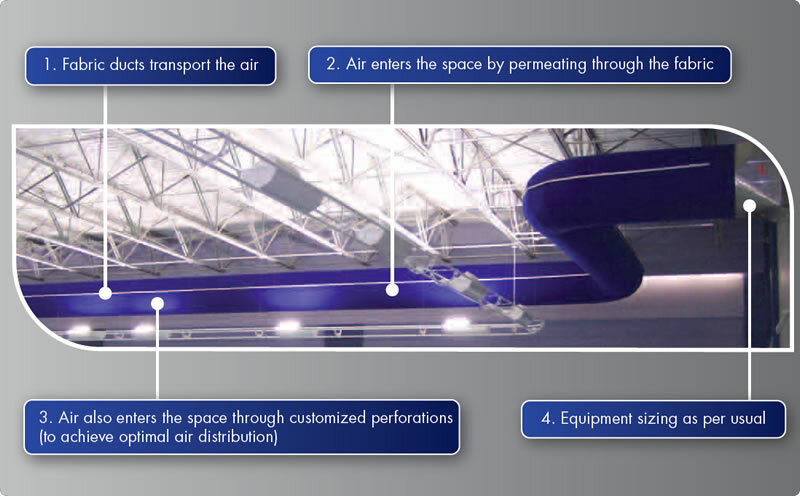 This allows you to use Euro Air ducts in special applications such as food preparation and storage facilities. All projects are custom designed to ensure perfect air distribution and comfort. No hotspots or draught. The proprietary Euro Air design & selection software allows you to accurately predict performance before it is even installed. No moving parts and air is diffused at a lower velocity. A major problem with steel ducting is condensation. Our permeable fabric leaks cold air throughout the entire duct surface to prevent condensation.